At Reba Farm Inn, we have 72 horses in a natural setting that includes 30 breeds. We know horses as well as anyone and better than most. Our unique herd allows us to truly understand equine behavior. Our horses all live together within a 400 acre rolling landscape at the foot of the Peaks of Otter. We offer trail rides and equine experiences of all sorts! Reba Farm Inn also operates a quaint Bed and Breakfast, featuring a unique blend of rustic and casual elegance with great views, warm beds, delicious food, and other amenities. We moved to Bedford, VA about 20 years ago from Northern Virginia looking for a simpler life. Boy did we find it. 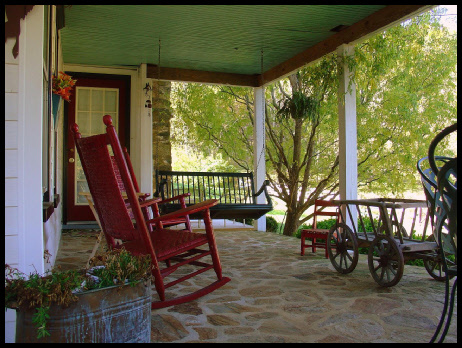 We refinished a historic farmhouse and turned it into a beautiful bed and breakfast. We bought just a few horses and held short rides to make our Inn stick out from the rest. Over the years, we have wrangled up a few more horses (the herd is over 70 horses strong) and acquired a few more acres to house them. Together, we have over 60 years of riding experience and have spent the last 20 years teaching and riding here at Reba. We love sharing our passion and we invite you to come and visit for the afternoon, the weekend or an entire week! We look forward to meeting you soon. Bedford, VA is a beautiful small town located between Lynchburg and Roanoke. We are within 30 minutes of each. The scenery is breathtaking as the Peaks of Otter loom over us in their stoic beauty. There are several local attractions nearby that you will be sure to check out during your stay with us! Our natural herd and landscape allows us to learn more about the horses than the average rider. We have spent the last 20 years taking “broken” horses and turning them into caring and dependable animals. Our goal is to get them rehabilitated and give them a purpose. Horses need that just like humans. We have over 30 breeds in our herd and they are ridden nearly every day. Our animals thrive in the natural landscape and we truly believe that we are able to provide an earthly “horse heaven” for our animals. You may have ridden at other places, but our horses are unique and with so many to work with, we can ensure that every time you visit it will be a different ride. Best place to lose yourself in a saddle or find yourself, whichever you may need. Reba Farm Inn is family owned and operated to give our guests the very best in personalized service.